Prominent & Leading Manufacturer from Mumbai, we offer non silicone spray, silicone spray, gp mr spray, heavy duty silicone spray and silicone release agents. Our offered Non Silicone Spray is categorically formulated to facilitate fast release of moulded components. These are free from CFC’s and are based on eco-friendly hydrocarbon aerosol propellant. These find its applications in polishing and finishing plastic surfaces. Furthermore, these are highly demanded among our clientele due to its excellent functionality and superior grade. Our offered Silicone Spray is formulated for applying on the metal products to keep them rust free and healthy in their working life. This is highly appreciated in the market as it dries fast and leaves a clear, non-staining film that does not stick or make a mess. Additionally, this performs effectively at reliable temperatures as well. 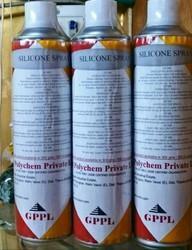 Contain Polysiloxane, which are highly thermal stable. It will extend the wiping period and the life of spin pack. It is Non Toxic & Non Carbonizing Lubricant. 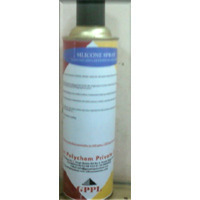 GP MR is a heavy-duty silicone release agent specially for the polyester Nylon & Polypropylene yarns. For protecting surfaces during all types of welding from spatter sticking to the welded surfaces. It eliminates build up in MG & TG tips & Nozzles in the CO2 welding equipment. It contains penetrating oils & corrosion inhibitors used as Multi-purpose maintenance aid which acts as a cleaner, penetrant lubricant, rust preventive and de-moisturising agent for all industries and household maintenance. Same as above but is ideally suitable for the articles to be painted after moulding. We also mfg. Audio Video Head Cleaner & Air Fresheners. d) Store in cool temperature below 50o C.
The only Silicon product available in 300 gms / 550 ml economic packing. Our offered Heavy Duty Silicone Spray is formulated with use of high-grade components making it non-toxic and safe to use. These are used for polishing and finishing plastic surfaces. Additionally, this has excellent paint ability to the moulded parts and good rust proofing to the metal moulds. Our offered Silicone Release Agents are highly acclaimed in the market for enhance productivity, extend tool/die/mold life, increase cycle times, improve part/surface quality and reduce scrap and defect rates. Moreover, it is superior to conventional silicone fluid. Above all, we as a team are focused providing release agents that help overcoming manufacturing challenges.